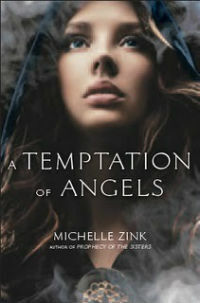 In Michelle Zink’s young adult historical fantasy/paranormal romance, A Temptation of Angels (watch the trailer below), protagonist Helen Cartwright has led a charming but ordinary upper class English life. Or so she thought. The sixteen year old has been raised by sociable parents who teach her how to fence and search for exits everywhere they go and often entertain guests in their home until late at night. One such night, Helen’s mother wakes her up and tells her that she must escape at once through a hidden staircase at the back of her bedroom closet. She gives the girl firm, clear instructions to not look back – ever. Helen traverses an underground tunnel that leads her to the only people who can protect and guide her while her childhood home burns to the ground. She meets the Channing brothers for the first time and learns their fates are sealed. Though confused and grieving the loss of her parents, Helen realizes she has a very important job to do. She must grow up literally overnight, and a new, stronger Helen must rise up and put to use all those odd lessons her parents taught her. They weren’t simply games after all, but Helen’s training to fulfill her role as a Keeper. The Channing brothers risk their lives to protect Helen from Raum, the man responsible for killing her parents and theirs – who was also once a boy Helen played with as a child. That’s the first catch. The second catch: they need Raum’s help in order to fight a greater evil that threatens the entire world. Even as a budding romance with one of the Channing brothers begins to blossom, Helen struggles with her undeniable affection for Raum. Which man will she choose and will her choice come into play when they confront the all-powerful demon known as Alastor? I think Zink played it a bit safe, as Helen’s choice between the two men is not really as difficult as the blurb would have you believe. That said, A Temptation of Angels is a quick, engaging read. Zink is also the author of the Prophecy of the Sisters young adult trilogy, as well as The Shadowguard Series for adults. Learn more about her here. Happy 90th Birthday To The Unstoppable Stan Lee!